When a reluctant boy reader hands you a book and says, “You have to read this,” you do it. 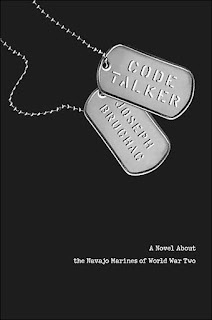 I’m usually not a fan of historical fiction, particularly novels set during wars, but Joseph Bruchac’s Code Talker is an exception, a book I’m so happy to have been recommended. During WWII, the US Marines charged Navajo servicemen to work as code talkers,transmitting radio messages in their language, which was impossible foroutsiders to decipher. These heroes saved the lives of countless soldiers, although their role in the military was classified until 1969. Bruchac tells the story of Ned, a young Navajo who wants to enlist. Starting with his youth, when he is taken from his parents to be educated, Ned has an understanding of his culture and the injustices Navajos faced. Bruchac sprinkles historical facts throughout the book in a way that feels fascinating, rather than didactic. I learned so much from Code Talker. My high school boyfriend was Navajo and I never knew that his last name, Begay, actually means “son of.” Bruchac writes, “Because that white teacher could not really understand our language, he did not realize that Biye’ in Navajo just means ‘son of.’ So he made Biye’ my last name, although he wrote as he heard it—Begay. Lots of other white men at other schools did the same. That is why we now have so many Navajo families like our own with the last name of Begay” (22). Bruchac is skilled in incorporating information into his narrative that inspires the reader to learn more. Code Talker instills respect and teaches, while being exciting and suspenseful. This is truly excellent historical fiction.